Hand-crafted, built by 3-generations of family in the midst of our 25-acres of nature trails. 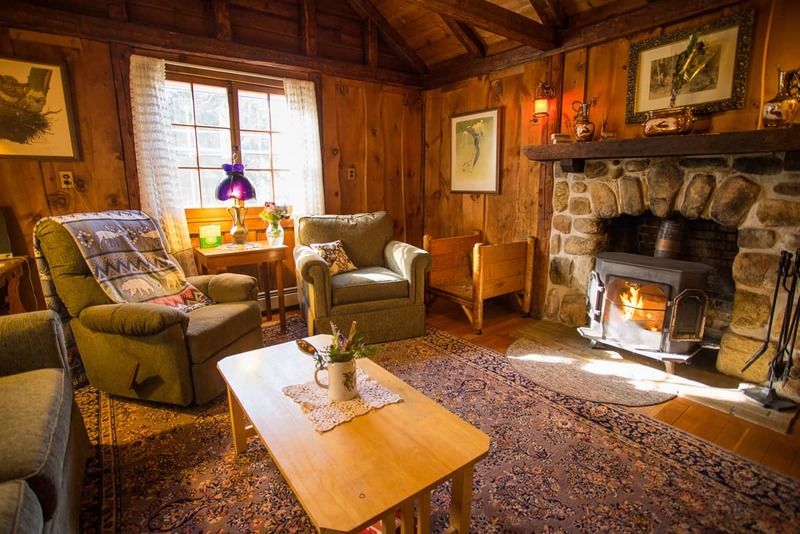 Relax by a crackling fire in your own Adirondack Great Camp cabin. 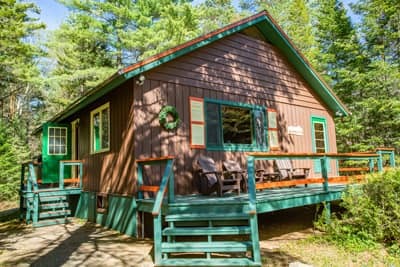 The Lake Clear Lodge & Retreat is one of the last original Adirondack Lodge's still open to the public on 25-acres of woods and water. 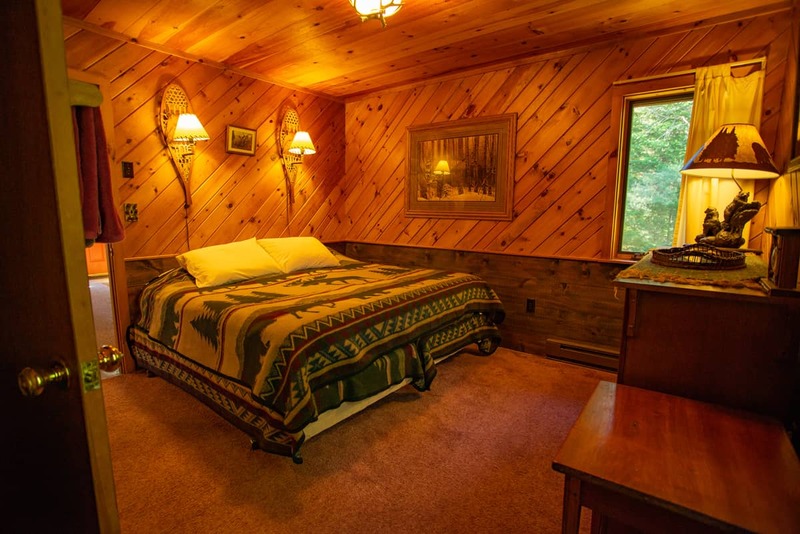 In traditional Adirondack Great Camp style, our chalets and cabins are spaciously set apart. 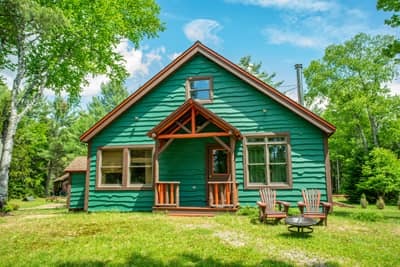 You are surrounded by an original 1886 Main Lodge with Adirondack Alps restaurant, a private swimming beach with canoes, kayaks, and nature trails in the summer, and groomed cross-country ski and snowshoe trails in the winter. The Lake Clear Lodge is proud to be 1 of 7 Audubon "Platinum" Green Hotels in North America. Our approach has been one of natural sustainability. Our Adirondack cabins were built from wood on the property that was milled on site. This natural wood was preserved not only on the exterior, but on the inside: placed there by three generations of family artisans, and a local builder. 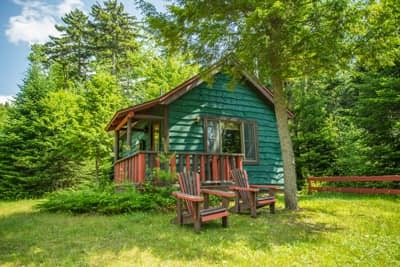 Each cabin has energy saving amenities, real wood fireplaces, and has been positioned to take advantage of passive sunlight or the natural shelter of the woods. 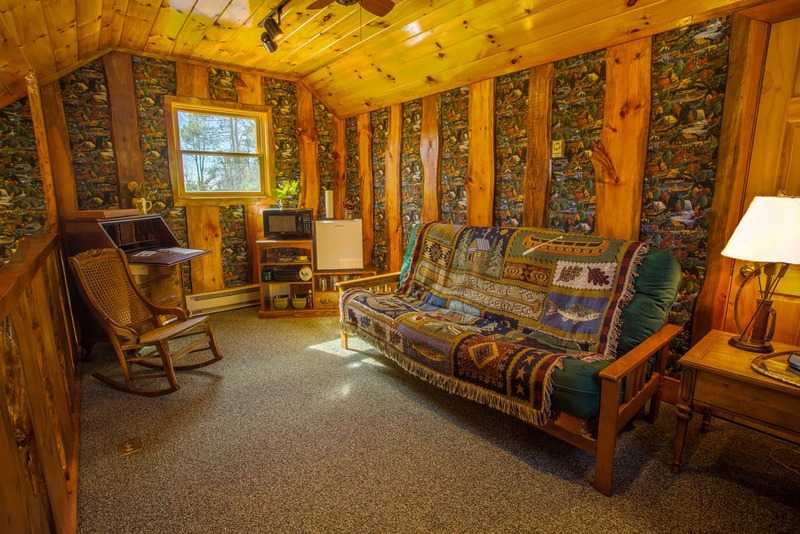 The Writers Cabin is a private "spa" chalet for two with a hydrotherapy steam-shower. It features a living room with wood burning fireplace and a distant sunset lake view. 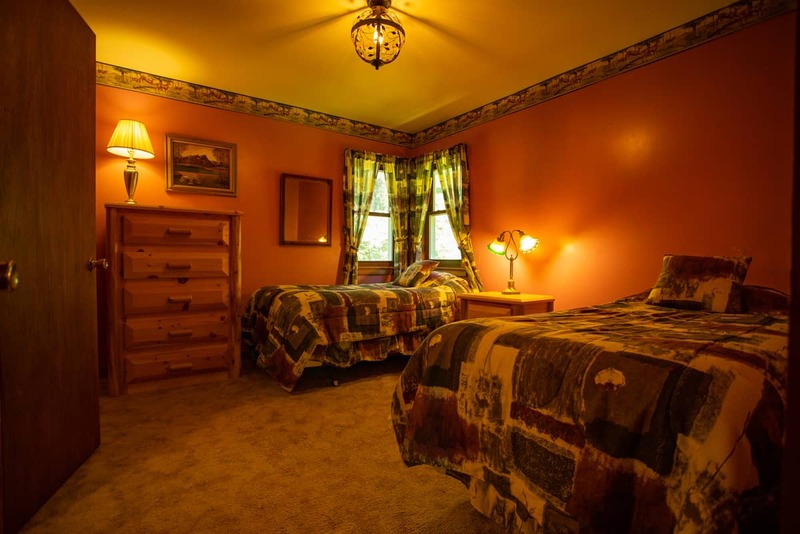 Our Adirondack pet-friendly lodging is immaculately winterized with fireplaces and hand-crafted knotty pine accents. Relax, watch the fire, and enjoy the Adirondack craftsmanship of the partial or full cathedral ceilings in the living areas with kitchen amenities. The 9-foot decks let you take in the sun all day. Depending on the chalet, they are an excellent retreat for 2-6 persons. 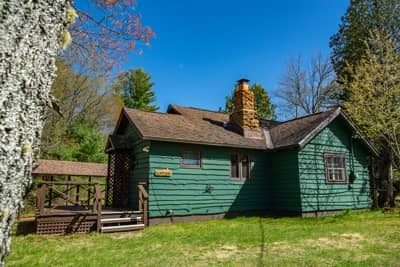 Includes outdoor grills, an outdoor fireplace, and picnic tables and just a short stroll to the lake. 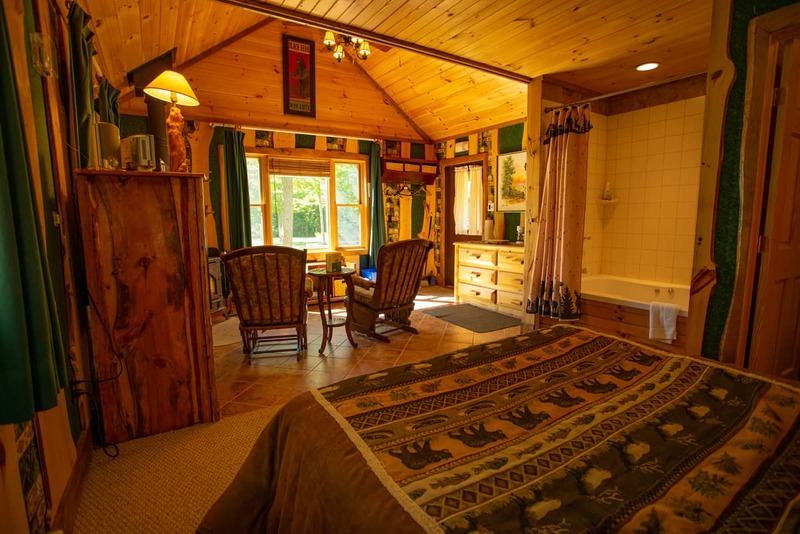 The Sundown Chalet is a two bedroom and one bathroom cabin with full kitchen. Features a wood burning fireplace, and is pet friendly! 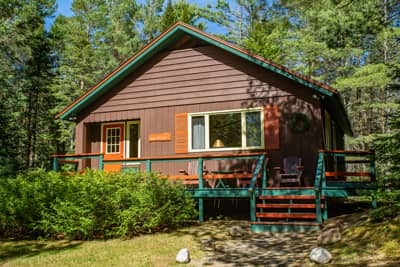 The November Moon chalet is a 2-bedroom chalet with fold-out couch, wood-burning fireplace, and kitchen. We offer a diverse set of experience packages, including romantic escapes, winter experiences, family vacation packages, and wellness retreats. These are all wrapped with savory culinary experiences from History of Adirondack Food Dinners and cooking classes to History of Beer Workshops & Tastings and Lakefront Gazebo dinners.